When discussing about flowmetering, a number of terms are important to consider, which include Repeatability, Uncertainty, Accuracy and Turndown, are commonly used. This describes the ability of a flowmeter to indicate the same value for an identical flowrate on more than one occasion. It should not be confused with accuracy i.e. its repeatability may be excellent in that it shows the same value for an identical flowrate on several occasions, but the reading might be consistently wrong (or inaccurate). Good repeatability is important. However, this does not dilute the importance of accuracy under any circumstances. The term ‘uncertainty’ is now becoming more commonly referred to than accuracy. This is because accuracy cannot be established, as the true value can never be exactly known. However ‘uncertainty’ can be estimated and an ISO standard exists offering guidance on this matter (EN ISO/IEC 17025). It is important to recognise that it is a statistical concept and not a guarantee. For example, it may be shown that with a large population of flowmeters, 95% would be at least as good as the uncertainty calculated. Most would be much better, but a few, 5% could be worse. This is a measure of a flowmeter’s performance when indicating a correct flowrate value against a ‘true’ value obtained by extensive calibration procedures. The subject of accuracy is dealt with in ISO 5725. 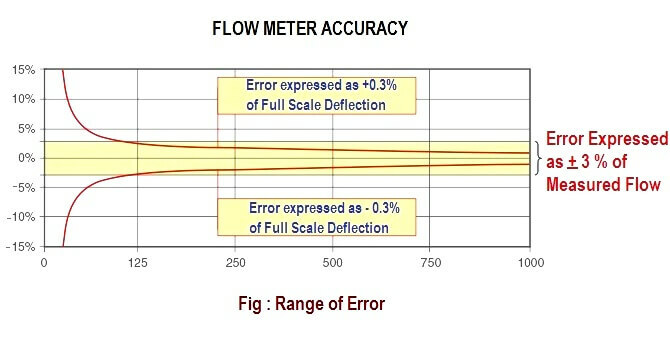 For example, a flowmeter’s accuracy is given as ±3% of actual flow. A flowmeter’s accuracy may also be given as a percentage of full scale deflection FSD, which means that the measurement error is expressed as a percentage of the maximum flow that the flowmeter can handle. Error stated in percentage FSD tends to be smaller than the error as a percentage of actual reading. For this example a value of ±0.3% FSD will be used. As in the previous case, the maximum flow = 1000 kg/h. As the flowrate is reduced, the percentage error increases. How can i save the page in pdf format. In the earlier version of the website there was option to download the page but now it is not available. 50 kg/h – 3 kg/h = 47 kg/h an error of – 6% —- It is error 0.6 % or 6%? 50 kg/h + 3 kg/h = 53 kg/h an error of +6% —- It is error 0.6 % or 6%?